Today Dan Brown, author of the Davinci Code, appeared in a British court to defend himself against accusations of intellectual property theft. The two authors of the non-fiction work The Holy Blood and the Holy Grail have sued Mr. Brown as well as Random House publishing for stealing the intellectual property contained in their book. They claim the accused have knowingly lifted the entire premise from their research and dropped it into the book in question. I’m not a fan of either book or any of the authors. I believe the hype surrounding the Davinci Code is silly. Never mind that, this posting isn’t about whether either book is good or bad. This trial brings into question the whole definition of copyright. Is copyright the legal protection of the idea contained in the text? Generally not, despite what the Holy Blood and the Holy Grail authors wish. Legal protection extends only to the precise text as it exists under the copyright banner. Copyright law is quite extensive and does vary from country to country, but it most certainly does not protect an idea alone. Patents do not protect an idea either. Patents are legal protection for a specific implementation of an idea. I am an author of a patent and did much of the work with the lawyers to create the initial draft for submission. Precise yet broad is always the goal in writing such things, yet the patent only applies to a specific instance of using the idea. These guys are simply looking to cash in. They should get bounced out of court and fined for abusing the legal system. Jay points out a blog article from Guy Kawasaki about this article over at Salon about naming. The Salon article is amazingly humorous. Guy’s is good too, but not nearly as funny in my opinion. Go read both now then come back here. OK welcome back. A few years ago I was working on a new, big product at Creo that was code-named Araxi (after the restaurant in Whistler) but everyone knew this was just an internal name and when we got to the point of shipping we’d have a real name. Everyone looked forward to having a really cool name that would go down in history as the best name ever. During the development of the product Creo established a business venture with Heidelberg that made this product a joint development to be sold by both companies. This made the eventual product name even more important, especially to our new partner, the style-conscious legendary giant of the printing world. Creo hired one of these naming companies. I don’t recall which one but probably its one of the companies described in the article. Some of the more memorable but not-so-weird potential names: Metro, Rally and Vivex. The development team also invented their own candidate name: Horse Choker (in the spirit of enough features to …). After what seemed to be the debate that would never end a product name was finally selected: Prinergy. It was sold internally as a fusion of the words Print and Energy and the logo was dressed up with weird little lightening bolts. It didn’t matter, after a dozen weird and not-so-weird names nobody had the strength the resist. Even so, the Prinergy product is still going strong and survived the dissolution of the Heidelberg relationship, merging with Scitex (the originators of a more established competing product), and the eventual acquisition by Kodak. The Canadian women’s hockey team won the gold medal today in Turino. There was talk today that this win isn’t as exciting as when (or if, given recent problems) the men’s team might win a medal. I completely disagree; these women might not be million dollar NHL players but that is exactly why their win is so fantastic. I expect the men’s team to win a medal although it looks a bit dodgy right now. That team is comprised of hockey players who’ve honed their skills based on world-class competition in the NHL all year. Three cheers for Canada’s finest Olympic hockey athletes! 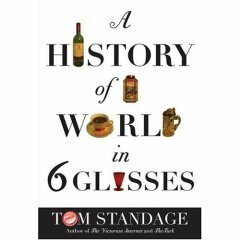 I slept in this morning and then stayed in bed long enough to finish reading Tom Standage’s A History Of The World In Six Glasses. Standage presents the history of civilization in the context of the inventions of various beverages: beer, wine, distilled spirits, coffee, tea and Coca-Cola. The writing is sharp and witty. The book was an educational read too: I didn’t fully grasp the origins of wine and it’s importance in Greek culture. In retrospect it makes sense but still it was new. I also found it interesting that none of these beverages originated in Europe. Beer, wine, spirits and coffee were Arabic inventions with rich and long cultural histories prior to European import. Tea first appeared in South Asia and was later brought to China and Japan although those cultures quickly created alternate history to explain its local origins. Later Europe was introduced to tea, the British Empire adopted it as it’s national drink, and the rest is tea history. And of course Coca-Cola was an American invention, with its own interesting and often bizarre origins. Seems it was invented as yet another quack medical cure and only later became a refreshing beverage for mass consumption. The book finishes up with a small discussion about water. Interesting to learn that most bottled water has less monitoring and quality control than the tap water available in most developed nations. Also interesting to know that the United Nation’s estimated cost of bringing reliable production of clean drinking water to poor nations is less than what consumers spend on bottled water every year. Recently Dean Karmen announced a new invention to cheaply produce clean drinking water with only modest power requirements. Standage mentions World Health Organization estimates 80 percent of illness in the world can be directly attributed to waterborne disease (also mentioned in Karmen’s announcement). Recommended if you are looking for a light yet fascinating read. The Netherlands has released really cool new animated stamps. Yes, these are regular postage stamps that can be attached to letters and sent through the post. They use a technology called Lenticular Printing to achieve this affect, and you’ve probably seen it before. It uses small slices of different pictures printed next to each other, with a plastic lens cover that only reveals one set of slices (all from the same image) at any particular angle. As you tilt the picture you see a different image. Do this tilting rapidly enough and you’ll see animation that mimics live video. Creo Kodak has several customers involved in this type of printing because our device’s ability to image 10 micron features onto a printing plate. Given good enough press conditions, these 10 micron features will show up on paper. Small accurate feature placement and printing means you can do things like lenticular printing on a large scale. I have no idea if these stamps are done with Creo’s imaging technology or not, but its likely. This is probably the start of a new trend in producing stamps. Even better that the topic is related to the Olympics.